This is a rich drink, and it’s definitely not low-calorie. On the other hand, it’s not as overwhelming or cloying as a lot of chocolatey cocktails are. Some cocktails are so sweet that you can only take one at a time. This drink isn’t like that – you have been warned. The dominant flavor here is chocolate, but you also can’t miss the hazelnut from the Frangelico. This drink actually tastes a little bit like Nutella, only creamier. The taste is addictive. It’s so complex and fascinating that it’s hard to put down. That’s why it’s hard to stop with one. This is great drink for parties, especially after dinner. It looks amazing, even when you don’t quite get the cookie rim right, and can’t figure out what you did better last time (ahem). Most people love it. It’s so rich and creamy and sweet. You can serve this with dessert, or in place of dessert. But I would actually suggest serving it along with appetizers or nibbles that are salty or savory. Just so long as they don’t have strong flavors of their own. Homemade potato chips would be a good option, as would pretzels or any kind of snack involving nuts. For the cookie crumble garnish, you don’t absolutely have to use Oreos. You can use any kind of chocolate sandwich cookie. I actually used the Back to Nature version of Oreos because I just like them better and happened to have them on hand. Any cookie that crushes up into a dark chocolate powder will work. It’s easy to crush the cookies. 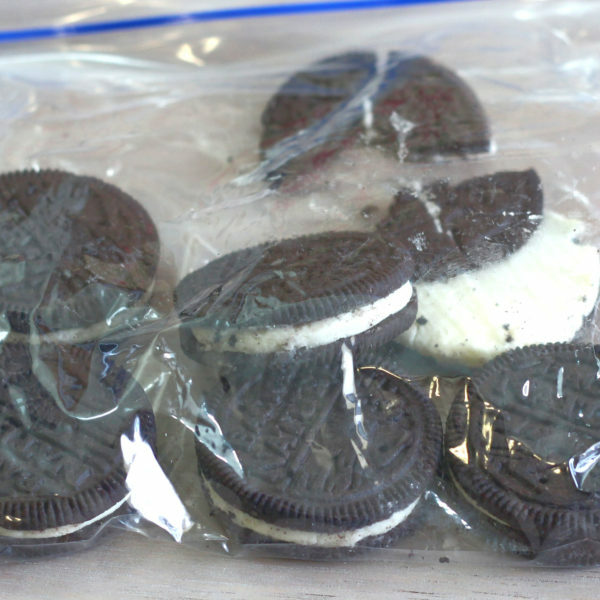 Here’s the way I like to do it – first, you put the cookies in a zippable sandwich bag and seal it up tight. Then I crush them inside the bag, which keeps all the crumbs and goo neatly in the bag. To crush them, I use whatever’s handy, which is usually a big liquor bottle since I’m at the bar. In this case, Goldschlager. 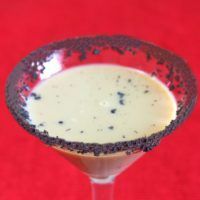 The Reindeer Tracks Martini features chocolate vodka, creme de cacao, Frangelico and cream. It's a rich, creamy, sweet treat of a drink that's hard to stop with just one. Fill a cocktail shaker with ice and pour in the vodka, Frangelico, creme de cacao and cream. 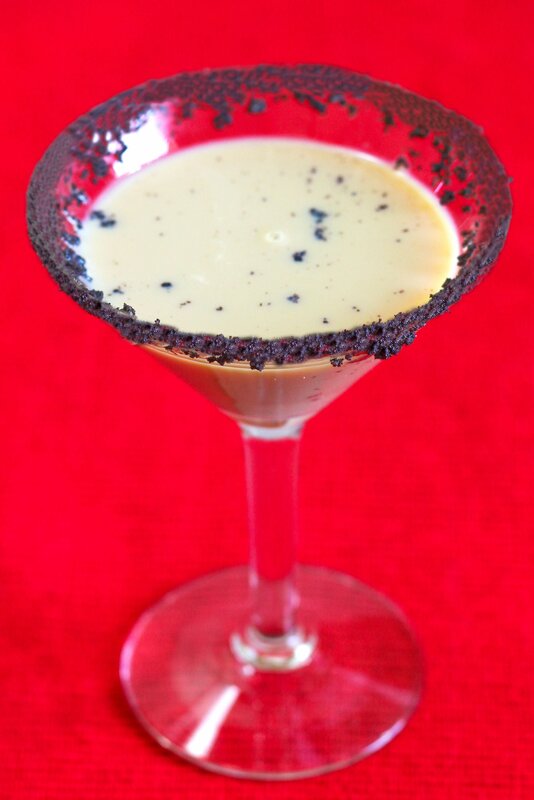 Rim a chilled martini glass with crushed Oreos. Pour the mixture from the shaker into the glass. Optionally, add more cookie crumbles over top of the drink. How do you think this would taste with a touch of mint? Very good! Are you thinking a little creme de menthe or schnapps or just a drop or two of mint extract?